Mercury in Delhi crossing 40 Degrees. Knowledge of a high-altitude pass by the name of Chanshal, deep in Shimla district. Motorbikes not yet broken into. Couple of days at hand. Love for travel. Desperation to break free of the heat. And a very helpful travel blog by Vargis Khan! 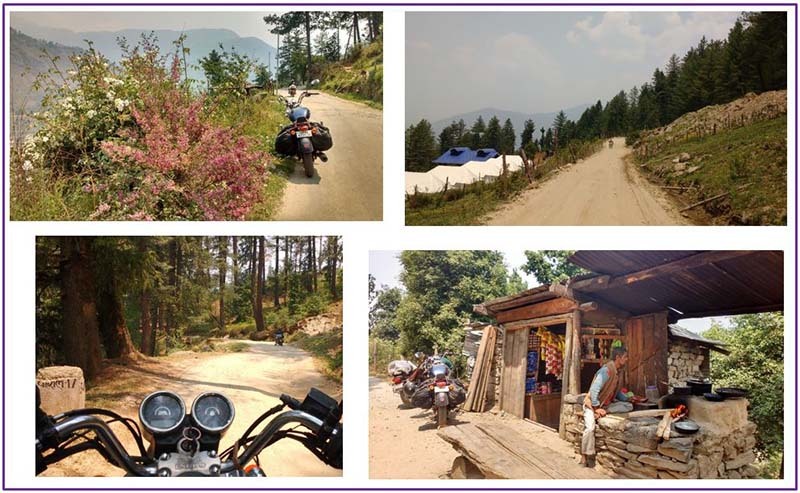 All the elements that propelled us into a memorable road trip to the Himalayas! I’ll ride fast through our first day, which saw us riding from Noida to Kyarighat, a beautiful and serene place about 20 kilometers short of Shimla. We chose it instead of the more popular Shimla, to escape the din of the hive that Shimla becomes in the months of summer vacation. The day’s ride was long and hot; Kyarighat, cool and peaceful. Our evening there was spent in a walk through the cluster of houses that made up Kyari, and to the woods beyond, that engulfed us in a serenity that we cherished for long. Hatkoti is a beautiful hamlet known mainly for the famous temple of Hateshwari Devi. After paying our obeisance to the Goddess, we were on our way to Rohru, only a short distance away. 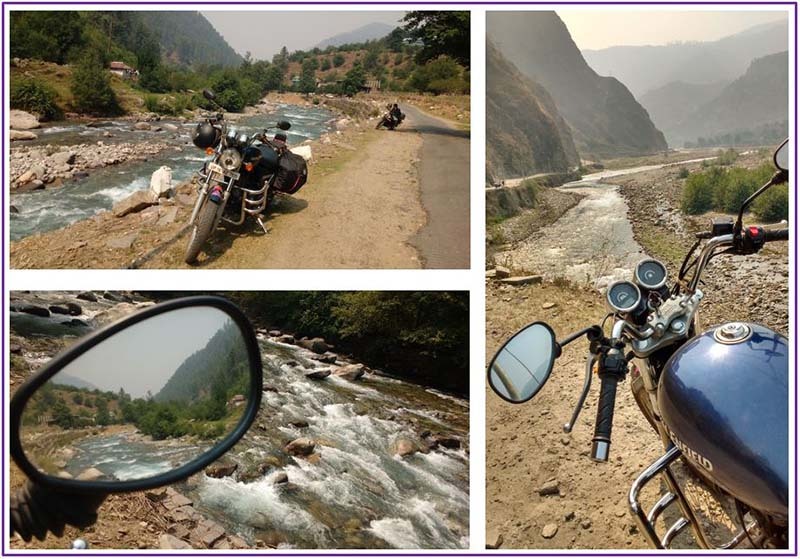 The road from Hatkoti to Rohru runs parallel to river Pabbar, and is a delight to ride on. In this relatively short distance we couldn’t help but stop often to take in the views of the gracefully meandering and gurgling river. It was smooth sailing till Tikkar, where we crossed over the bridge on Pabbar river, bidding farewell to her for a day or two, and started climbing the mountain. The vistas opened up as we went higher, and even the vegetation became thicker and colorful; the road was lined with myriad wild flowers, showcasing their presence with fragrance as much as with the bright colors! Pabbar could now be seen far down below glittering like a silver ribbon. The road had narrowed down by now, and few kilometers before we hit the next settlement of Larot, it’s smooth texture gave way to a rough dirt-stone track, wide enough but quite rough still. This slowed down our progress considerably! In and around Larot, the hillsides were dotted with Apple orchards, and as we passed it and climbed higher, this mantle of Green was taken up by Deodar forests. We were now riding in the cool shade, but still the road battered us. 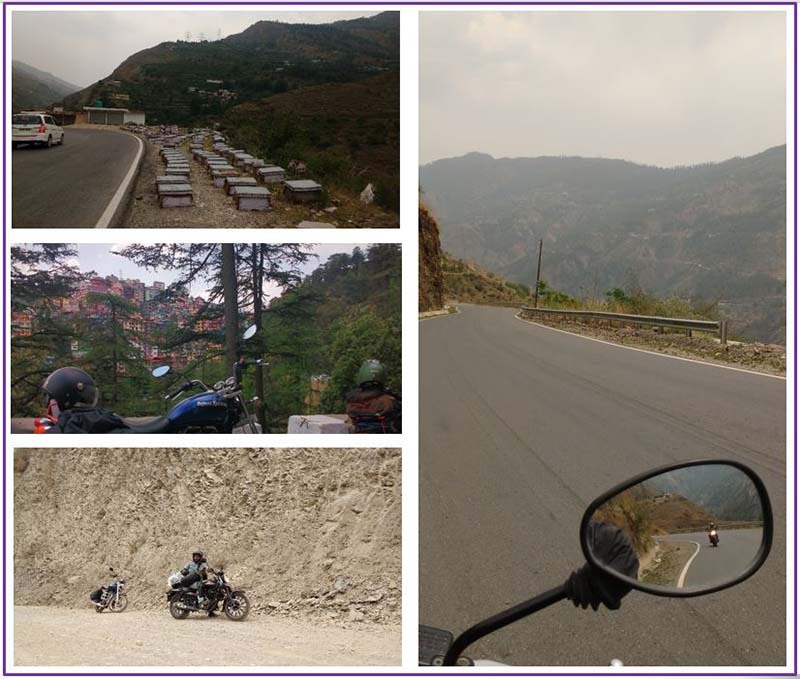 Nature’s beauty did a good job of overpowering road’s wrath, and we rode on with determination! Soon we emerged out of the forest and found ourselves on the open mountain-road, the slopes now covered with Rhododendron bushes flowering a beautiful shade of Purple. We had left the tree-line behind and looking up could make out the zig-zagging road disappearing into the mountain top; the pass was not far now !  For the first time since we started from Kyarighat, we came across a small group of three motorcyclists, slowly and carefully making their way down the rocky road. We couldn’t be far now. As we rounded a corner, we came across a tea/snacks shop, and a few tents pitched on a green meadow on the other side of the road; a small ancient temple quietly sitting at the edge of the cliff, looking over it all. But we did not stop here, since we could see the rocky path stretching straight for more than a kilometer across the shoulder of the mountain, and we were sure, to the Pass not far beyond. We rode this last stretch in a measured haste and within minutes, there we were at the Chanshal pass- a U-turn on the road, around 3-4 cars and bikes, a yellow-tarpaulin bunker-like shop and a worn-out board standing in one corner, declaring that we were at 12000+ feet – at Chanshal! But the strongest element here was the Wind- the howling, freezing and the propelling wind! Out in the open, we couldn’t stand straight without swaying and it seemed to be pushing us out of Chanshal  After briefly glancing around, we took refuge in the shaky shop, had hot Maggie and Tea, which refreshingly soothed our nerves, and then with a new-found vigor, stepped out to shoot some photographs at the Pass. That accomplished, we gunned the engines of our bikes, and started the last bout of journey for the day, to the village of Dodra. The drive to Dodra was uneventful and having ridden over unfriendly surface for better part of the day, we were mentally drained out and hoped to reach the village soon. However the road, if you can call it that, only got worse and we were literally sliding and careening over small rocks and pebbles. As we descended, we again entered the forest cover. There was hardly a soul in sight. For the next two hours we came across only three evidences reminding us that we were not alone in this part of the World- a speeding, dust-cloud-spewing Bolero, a rocky shelter declaring that we were now entering a Wildlife sanctuary, and a flock of sheep and a Shephard dog keenly eyeing us!  There was no trace of the village yet, and then as we reached a turn on the road, Dodra popped up in front of us, radiating an aura we weren’t prepared for! It was beauty, mysticism and tradition all woven into one hamlet that Dodra was. We were held in its awe! After gazing at this sight for few minutes, we proceeded towards it and at the very entrance of the village found the inn of Negi Ji, where we switched off the weary engines of our bikes, and a sense of relief overcame us. We had come as far as we had planned to, faced no major trouble, the bikes were healthy, and few hours of sunlight still remained for us to explore this small village! After having a glass of sweet-smoky Tea at the inn, and having dumped our luggage, we walked out on to a narrow track bordering the inn, and soon found ourselves on the village streets. We visited the temple complex in the center of the village, befriended a few young boys hanging around there, and kept strolling randomly for a while. The invitation was extended to us too, with the promise of lamb and spirits, and we thanked them heartily! More than one family invited us into their house, asked us about the purpose of our visit, told us about their village and life, and each one offered us Tea, without fail! We accepted every cup !  By the time dusk settled in, we were full of Tea and pleasant memories! It’s a peaceful life in Dodra. People stay busy with their fields and livestock. Fruits and vegetables grow in abundance. Heavy snow cuts it off from rest of the World for a few months in Winters when the residents just relax and live on the ration stocked for these months. People seemed content. We headed back to our shelter for the night, with a smile in our Heart, and after a sumptuous dinner by the brick hearth in the kitchen, we settled in for the day. Because tomorrow was going to be a long and strenuous one! We made a brief stop after crossing Chanshal, and then rode all the way to Rohru, stopped again for a road-side delicacy- a rich, creamy, dry-fruit and ice-cream filled Badam shake!  It was a delicious sin!  After crossing Rohru, we decided to give a break to our body and the bike, and rode down to a stretch of river-beach. Half an hour of soaking our feet in in the icy waters and listening to the music of the river once again re-energized us, and we took off! At Hatkoti, we took the turn towards Tiuni, and in a few minutes, we were riding on the most beautiful road of this trip! Pabbar flowed with us, the road was now surrounded by pine forests, and beautiful houses with surrounding fields could be seen beside the river-bank. We were now in Uttarakhand. About an hour or so of ride brought us into Tiuni, where the river passed through the middle of the township. There was a row of dhabas alongside the river, and we had our lunch break here. For anyone having a liking for fish, this place offers splendid preparation of fresh river-fish! There was a man tending to a fishing net, in the dhaba where we had our lunch, and we inquired with him about the distance and condition of road to Chakrata. Road was good but the weather up there could be misty and cold, is what he told us. We paid heed to his advice and donned our wind-cheaters, even though it was warm at that time of the day. From Tiuni, the road started winding up the mountain, and we gained height rapidly. Glancing down we could see the river snaking along in the valley between the two range of mountains; it was so far below us. The road was very good, the traffic sparse, but we were a bit tense now, for the Sun was descending fast and we still had a long way to go. On this stretch of the road we saw a lot of small rocks strewn on the road, having found their way there from the slopes above, and quite often we came across the warning signs of “Falling rocks”. We proceeded with caution for some of these rocks were the size of football! Perhaps the Weather sensed our fear, and it started to play with us. The sky quickly darkened and the clouds started to rumble, the wind picked up. We accelerated, and prayed silently for the rain to hold back! Suddenly the wind died down completely and there was a heaviness in the air- we knew what was to come now. The first drop of rain hit my arm, and the game commenced! It was drizzling now, the kind one would normally enjoy, while stannding in the balcony of a flat or walking down the road, in a city. But these were mountains and we had no human settlement in sight. Then we saw the milestone of a village “Sawda” fly past, and caught the number 12 marked on it. We did the math, and decided mentally that we must reach it at all costs. Next thirty minutes were adrenaline filled! We were scared, the rain had picked up, the wind was now strong enough to shake us and the bike, every now and then we saw flashes of ligtening falling down; and there were no parapets on the road, to provide us a sense of safety, lest we skid off the road! But we rode fast and hard, all our concentration on the stretch of road that our bikes’ headlights could illuminate, and desperately counting each passing kilometer. After an eternity, which was actually only 20-25 minutes, we saw the lights of the village down a few turns, and we knew we were safe. As we entered the village, we stopped at the very first roadside tea shop, where the people were huddled together in the light of the stove, and joined them. By now it was raining heavily. After two cups of Tea, and roughly half an hour, the weather cleared, to our greatest relief! 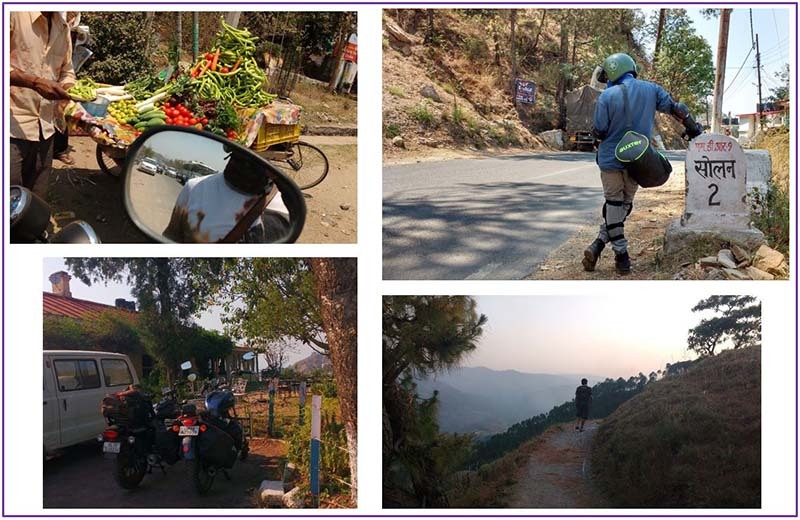 We still had around fifty kilometers to cover before we reached the day’s destination of Chakrata. Without wasting any time, we hit the road again and after a while found ourselves driving through beautiful Deodar forest. As we rode, through the gaps in the trees we could see the bright orange ball of fire slip behind the mountains. The rest of our ride was in pitch dark through the wooded road, and barring a rough patch of around ten kilometers near Deoban, the going was comfortable. 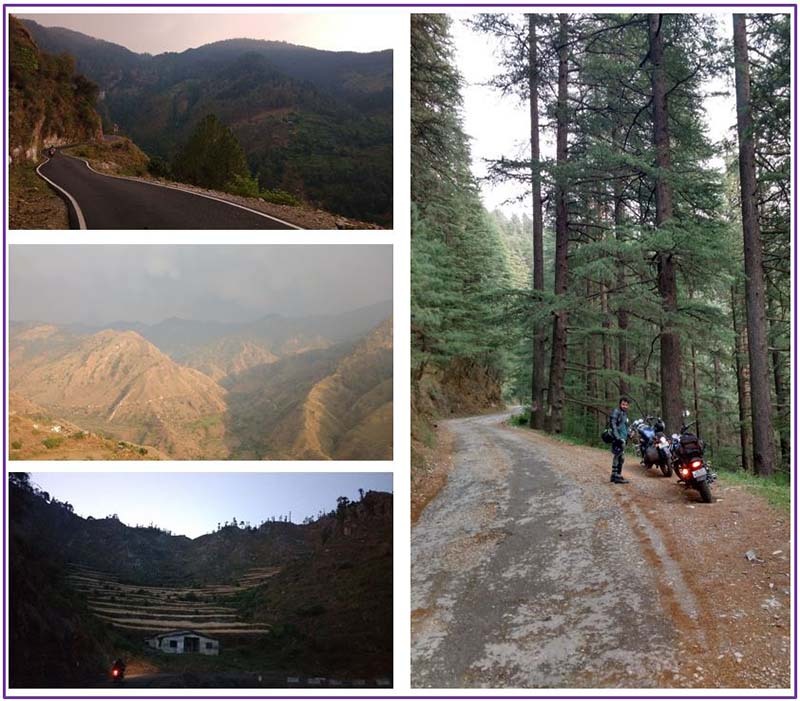 However, we couldn’t make out much of the lanscape or the places that we passed in this darkness, and around nine ‘o’ clock, we rode into the eerily quiet, barely-lit cantonment town of Chakrata. As if the body and mind were waiting for it, both surrendered and after a hot meal and shower, it was only deep slumber! Dependable mechanics are available in Theog and in Rohru. I had trouble with my bike’s spark-plugs, which the mechanic deftly took care of, replacing the spent one with a genuine spare-part. Reference: Pravesh Automobile 9882342476/7807155551 [Theog]. Sufficient number of Filling stations are available all the way to Rohru. 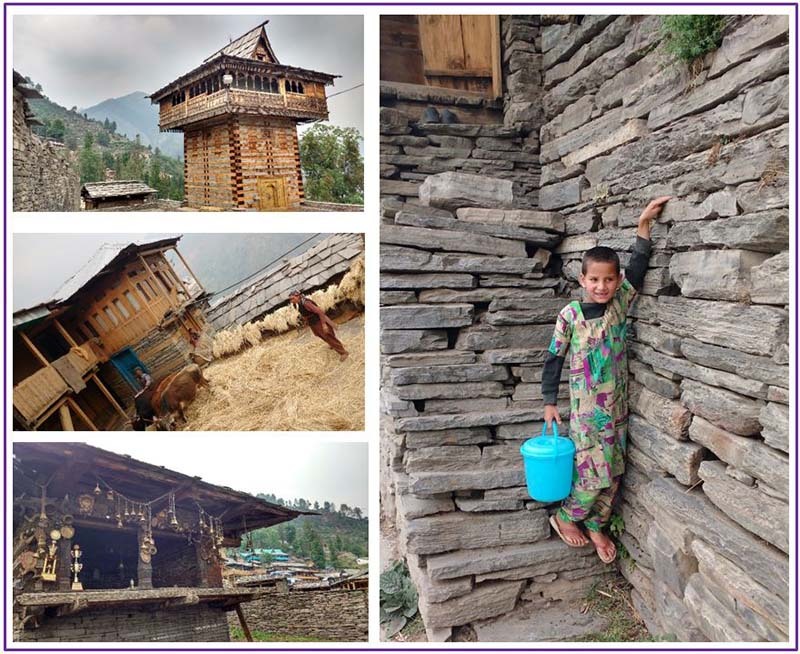 However, beyond Rohru, on the way to Chanshal, only one is available few kilometers outside Rohru; same is the situation on the road to Chakrata, via Tiuni. So before heading in either direction, the safest bet is to tank up at Rohru. Roads are mostly very good on this entire route, except the approach road to Chanshal (this too has been declared as an NH, so might have a bright future!). Google Maps shows a road from Dodra-Kwar to Chakrata, via Seva and Dhaula, on to Netwar and Hanol. However, this is only a pedestrian track and not motorable, even on two wheels. So, please don’t consider it as an exit route from Chanshal/Dodra-Kwar. 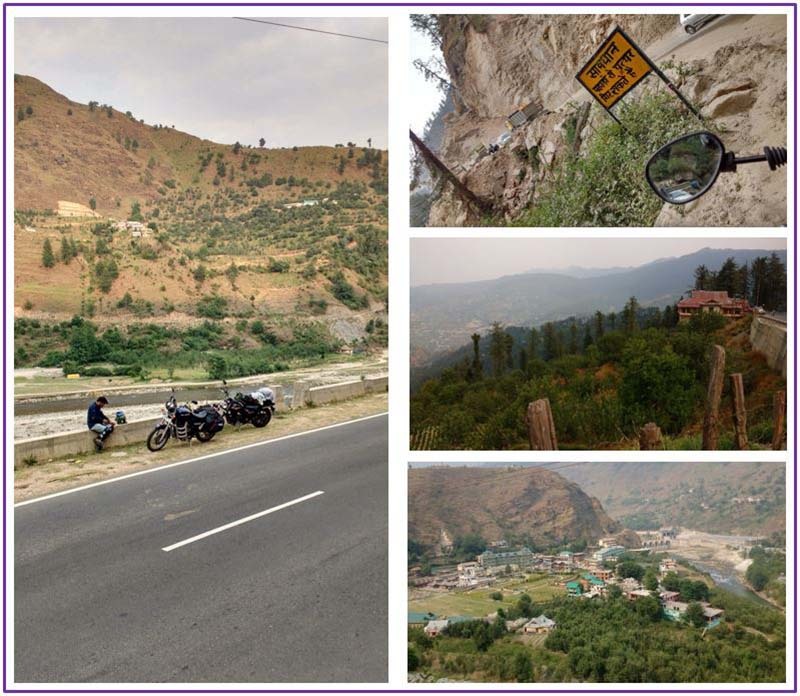 The drive from Tiuni to Chakrata, in its initial phase, is wonderful but dangerous. This is because a) loose rocks/stones fall on to the road, b) there are no parapets! The road is perched high on the mountain’s shoulder and the river and its valley far below look beautiful. One would be often tempted to glance down while driving but this is very risky as you lose the line-of-motion. It is better to park on one side, take in the views, and then carry on, even if it means spending more time. I hope you enjoyed reading the log above and found information that could be of help. If you have any further questions, please feel free to ask in the comments section below; or at the Community Forum; and I will be glad to answer. 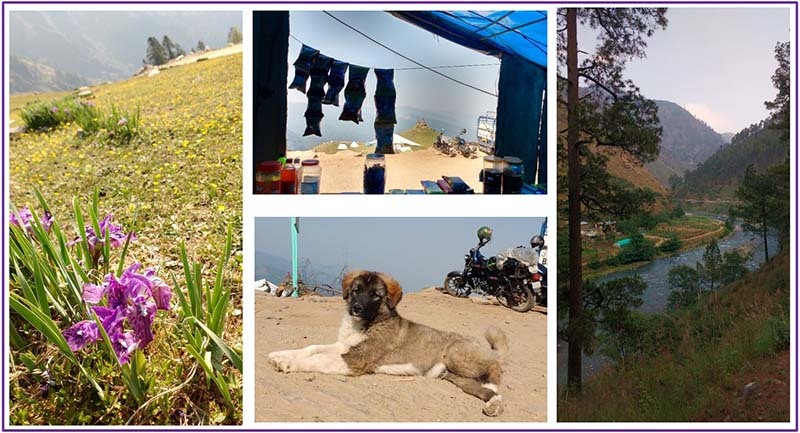 Kirtiman Rathore is an Electronics engineer by profession, and has a love for travel and nature. This passion of his finds expression in his photography and writing, through which he tries to take the reader on a virtual journey. Kirtiman is currently living and working in Noida, and travels mostly in Northern India.